L: 94" x W: 43.5" x H: 39"
Claudella Sofa Comfort, style and quality—all three are brought to the forefront by the Claudella sofa. This piece takes classic elements like bun feet and pleated arms and adds chic, on-trend accent pillows to create a blended look. Neutral upholstery works with any design scheme. Plus, the seat back and cushions can be flipped, so this sofa will keep looking like new. Based on your zip code 06828, this item can be delivered in 3 days or less. In-store pickup includes unlimited furniture items and can be available in most showrooms within a few days. Comfort, style and quality—all three are brought to the forefront by the Claudella sofa. This piece takes classic elements like bun feet and pleated arms and adds chic, on-trend accent pillows to create a blended look. Neutral upholstery works with any design scheme. Plus, the seat back and cushions can be flipped, so this sofa will keep looking like new. Frame Height w/o Pillows: 30.5"
Inside Arm to Arm: 78.5"
Woven blend of 65% polypropylene and 35% polyester. Frame joints are reinforced with corner blocks and heavy-duty metal fasteners for added strength and stability. Heavy-duty, S-shaped wires stretched across the frame from front to back provide the entire seating area with uniform comfort and support and prevent sagging. First off, this sofa is extremely comfortable, but it's quite large. Be very careful if you don't have a big space to put it, my living room is on the small side and this with the loveseat took up all the space. The only reason I didn't give this furniture 5 stars is the fact that one of the cushions had a knot in the middle of the fabric that was obvious to the most casual observer. The delivery guy cut it off with his utility knife and entered it into his report, haven't heard a word from Raymour and Flanigan, so I will be contacting them soon. I was trying to fill a rather large room and purchased 2 sofas, 1 chair and a half and the cocktail ottoman, which might be my favorite piece! There was a snag in one of the cushions when first delivered but the delivery team and our local store had a new one to us within an hour. These pieces are oversized and filled my large room but super comfortable with a very classy feel! Loving the new couch and love seat. It looks like a very expensive piece of furniture, it's firm and seats people comfortably. The pillows add a very classy look and are beautiful blends of taupes, beiges and cocoa browns. Very happy with this purchase! It looks very expensive due to it's massive size, it's comfortable and has a soft fabric. I have 2 small dogs and 2 cats that are always on the sofa, and the fabric still looks as good as new because the chenille fabric hides any dirt very well. I LOVE my Claudella Sofa! I had been browsing for furniture for months and nothing really caught my eye. Once I saw the Claudella sofa, I knew it was the sofa for me. I loved it, it has a bit of shimmer! (but not where it will be out of style in 6 months or be out of place in a typical home). My last couch was microfiber and literally I was fixing the fabric or adjusting the cushions every day. The Claudella has clean lines and the fabric always looks amazing even after the dogs or kids sit on it. We love this sofa!! We have a two year old and an 80 lb dog and this sofa has held up great!! After a year and a half, it is still super comfy! It is so deep when the back cushions come off, it basically becomes another bed. It was such a great purchase for us! Great sofa! Very comfortable and looks beautiful! Great quality as well! I didn't have much space 13 x14 room, open floor plan. So I only had limited design options for sofa placement. I love this sofa and half chair. The collection is super comfortable. The pieces are on the larger side in length and depth. Make sure you measure and plan out your room. With these two pieces, and small chair it's enough seating. The color is great - really opens up the room. I originally went in for another living room set that I had seen previously when the Claudella options were shown to me. Love the deep cushions and the high back of the sofa and the chair and a half. The fabric is neutral and goes with everything! There is a lot of throw pillows which I don't use all the time, but its nice to save a few and swap out when necessary. The service was excellent. The deliver men were courteous, timely and inspected everything when it was unwrapped and in the room. Loved the fact that it not only was wrapped in a quilted blanket for protection but also wrapped in plastic to protect everything. We are happy with the looks of this sofa. It is classy and looks high end. Very comfortable. looks great in our living room. Very comfortable and we would recommend this to anyone. Couch love seat and chair so lovely! This new sofa really makes our living space look clean & fresh. 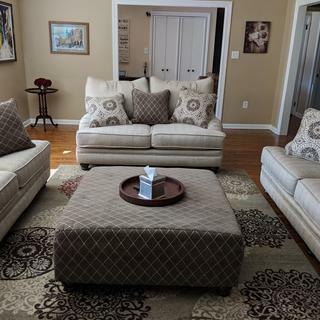 Great Traditional/Transitional set providing a comfortable living room which is perfect for entertaining. Lighter color fabric with awesome throw pillows will create a space that looks like you hired a designer. Quick delivery as usual! I absolutely love this sofa set. I purchased the sofa and love seat. I saw it online and when I saw it in person I knew this is what I was looking for. It is very comfortable and has a nice style to it. Makes my living room look very warm and chic!! Glad I bought it no problems with salesperson or delivery. Love Raymour and Flannigan. Was better than we expected. Husband is 6'5" and this is the first couch he can lay on and his feet don't hang off the end. Have never seen a man this excited over a couch. Have to get used to a large sofa and love set this oversize sofa is for someone that wants to relax and watch TV it’s great it’s roomy and I’m happy. What I really like about the loveseat is you can stretch out on it and usually they’re too small. I recently purchased this sofa and I Love it, it is big and confortable. I choosed this sofa because the light color. It goes very well with my decor and it also gives my a piece of mine that when I change my decor it will go well with any color I choose. I fell in love with this couch at first glance. It was unusual in color, comfortable and big to fit my large living room. It definitely makes a statement and with curtains that go with it, It makes a dramatic statement in the room. Built to last, not flimsy like most sofas today. Looks classy and very comfy. Price for the quality is a real bargain. Material is thick and will last but still soft. You can remove the bolsters to get a wide sleeping area if needed. We love the look of the new couch! It goes great with our living room decor. Great value, excellent salesman service. We would highly recommend this couch! I am very pleased with this purchase. The sofa and tables are great. The salesman, Raheem was perfect. I will recommend him and your company.....actually I already did. Everything is perfect. Looks great in my living room. Furniture was in perfect condition. Delivery went great. I’ve had this sofa for two years...and it looks like new.Im very pleased with this product and how it’s holding up! Have received many compliments on this set. Love Raymour and Flanagan. Couches are not as comfortable as it looked in the store. I Love, Love, Love the sofa it is so comfortable and cozy. It really has a wow factor to it and just love the color and texture of the material a great deal. I have a large living room space and needed to fill it in and it worked out great. However, be careful if your living room is small because the sofa runs wide. Lastly, but not least just want to say if you want to experience great sale service you must see Earl in 440 NJ-440, Jersey City for a Tremendously Splendid service!!! Does this come in additional colors? BEST ANSWER: The Claudella Sofa is available in the upholstery as shown only. Will this sofa got through a 30 inch doorway? BEST ANSWER: Yes. With the feet and back cushions removed, the Claudella Sofa will fit through a 30" doorway. What are the accent pillow dimensions ? BEST ANSWER: The square accent pillows are all 21" square and the kidney pillow is 24" X 16". BEST ANSWER: The upholstery on the Claudelle Sofa is a woven blend of 65% polypropylene and 35% polyester. Your description says Hardwood and furniture-grade wood frame materials, can you be more specific pls? BEST ANSWER: The Claudella Sofa frame materials are made with hardwoods such as oak and poplar. Along with plywood that have been nailed, stapled and corner clocked to create a structure that is strong and durable. Where was this sofa made? BEST ANSWER: Hello Teresa, thank you for your interest in the Claudella Sofa! This collection is manufactured in Mississippi. Can i scotch Guard to make sure it stays looking good? BEST ANSWER: Hello Maria! We do not recommend using scotch guard on your furniture. Please use the recommended cleaning instructions for the Claudella Sofa: Lightly brush or vacuum frequently to remove dust and grime. Spot clean with water- or solvent-based cleaners. Pre-test cleaning methods on a hidden surface. A professional cleaning service is recommended for an overall soiled condition. Would this sofa fit through a 29 in doorway? BEST ANSWER: Every delivery situation can be different, but with the feet and cushions removed, the Claudella Sofa should fit through a 29" wide doorway. What is the measurement from seat to floor please? BEST ANSWER: The Claudella Sofa seat height is 21". What is the dimensional width for this sofa? BEST ANSWER: The width of the Claudella Sofa is 43.5". Is it comfortable for every day usage? BEST ANSWER: The Claudella Sofa is comfortable for every day usage. Does this sofa come as a pull out bed? BEST ANSWER: The Claudella Sofa is not available as a sleeper sofa.